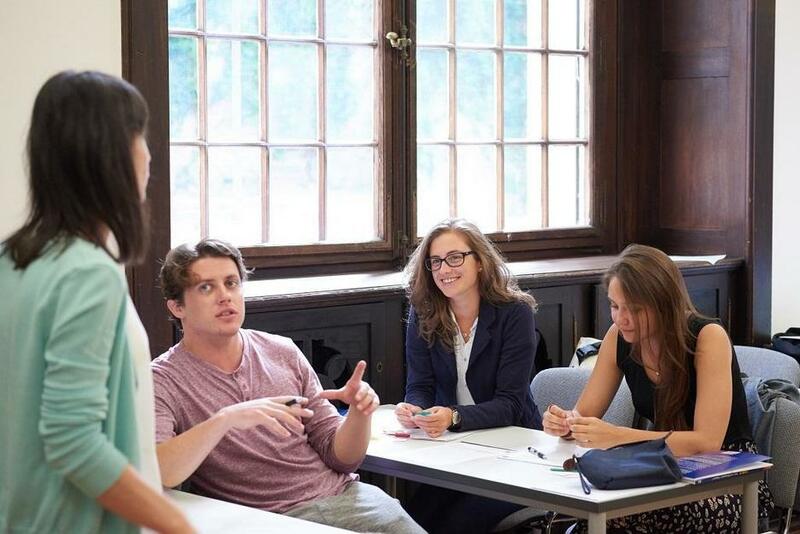 Collegium Palatinum – IH Heidelberg, founded in 1958, offers quality German courses for academic, personal or professional purposes all year round. The school is located in a historic building with an exceptional ambience and provides students with the perfect environment to live and learn. The Collegium Palatinum is authorized testing centre for telc Language Tests and the TestDaF – exam. As an affiliate of IHWO (International House World Organisation) and member of IALC (International Association of Language Centres) the school is committed to highest standards in teaching languages. Course participants attend 25 regular morning lessons per week where they cover relevant vocabulary, thematic topics and grammar structures to broaden their language skills and their spectrum of the language. In 5 afternoon sessions per week, participants receive special telc examination training. They run model examinations and are provided with individual consultation in their exam preparation. The telc-examination preparatory course is highly recommended to all students who wish to take and pass a telc Deutsch examination with the best results possible. Ich kann nur sagen, dass es eine tolle Erfahrung war! Das Gebäude von der Schule ist wunderschön und die Lehrer sind gut ausgebildet und auch sehr nett. Heidelberg ist auch eine schöne Stadt und es gibt viele Studenten aus aller Welt. Ich würde es einfach jemandem empfehlen! Ho imparato davvero molto! I docenti sono molto gentili e preparati. Inoltre ho avuto la possibilità di conoscere tantissime persone di culture diverse. Consiglio ih Heidelberg Collegium Palatinum a tutti quanti! P.S. L'edificio in cui si trova la scuola è davvero bellissimo. Great School, with very well prepared teachers. I recommend Collegium Palatinum if you wan to learn how to spoke a good German, as well as writing and reading.